This filly will be a winner in halter and performance. She has awesome hoch action and has a long upright nech with a thin troat lach. Her Dam is out of King Afire by Afire Bey V. Her Dam has multiple half sibblings that are multiple national Scottsdale and Buckeye champions in halter as well as performance including : "She be Jammin" 3 Time US National Champion breeding saddle pl. type 1 Time Canadian National Champion saddlepleasure type, Scottsdale Champion saddle pl type and Scottsdale Res. Champ. Country pleasure driving; "D-PHI-ANCE++" Regional top five hunter, Regional champion Gelding in hand, and multiple other hunter halter and showhack wins and: "Bella Amora BPA" Top 10 US National yearling filly Region 7 champion yearling filly and 2 Scottsdale top 5 Mare breeding saddle type. She has a great attitude and has been super easy to train for her trims, to tie, lead, bathe and clip. Our plan is to show her next year at region15. 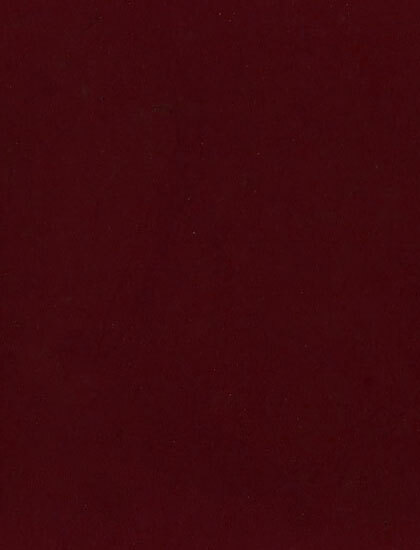 $8,500. 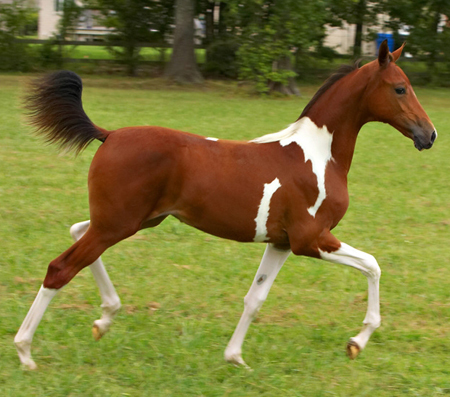 # 1A366952 - National/Scottsdale quality 2008 half Arabian pinto filly by THE COLOR OF FAME x Madawna out of *GONDOLIER Beautifully marked - awesome attitude – Halter prospect Sweepstakes Nominated $17,000. 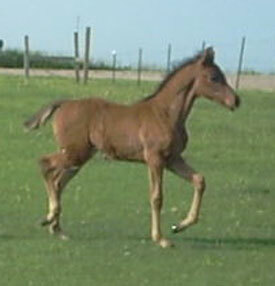 Gorgeous, leggy half-Arab filly by The Color of Fame. This girl has hock action like you would not believe - naturally higher than the knees – at only 3 months old. 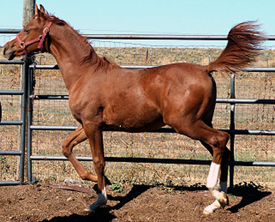 Fames Amazing Grace has the style and attitude for the halter ring with the build of a performance horse and should mature to the 16+ hand range. “Guinness” is triple registered, Sweepstakes nominated, in US and Canadian halter, Iowa Gold Star, and North Star futurities. 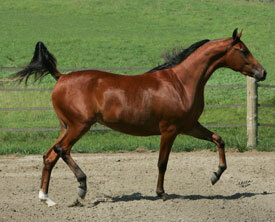 She is currently in training for halter and price will increase the longer she is in training. 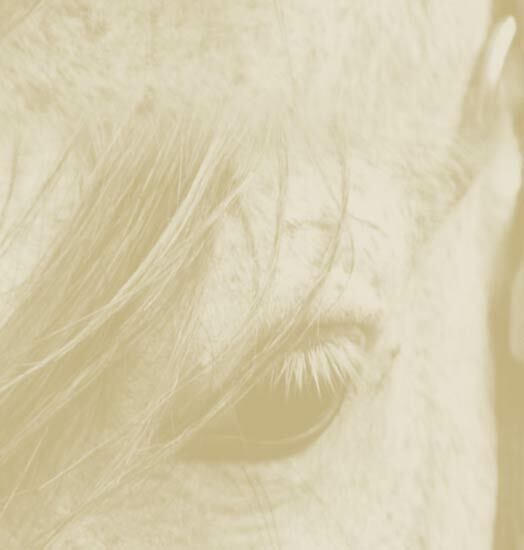 Don’t miss out on your next English horse. For pictures contact Kelli Barnes at barn0363@umn.edu. Asking $7500/obo. A 2006 big bay colt that is out of a Bucharest V daughter, who in turn is out of the dam of DR Sinful Seductions “Primo” is the Iowa Gold Star Auction Colt for 2007. 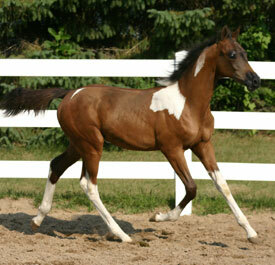 He is also nominated into their open futurity, both National Futurities, and Sweepstakes program. DVD Available. This three year old filly is already a garnering Regional Top Five wins as a Hunter under Saddle. 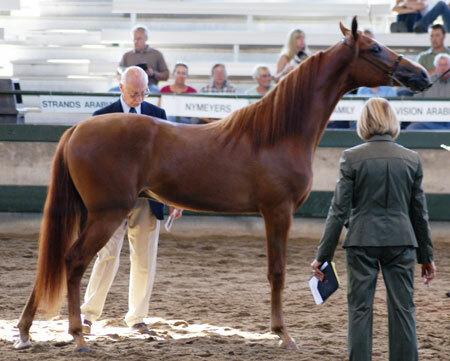 Her halter career has spanned all three of her years, and she has a 2006 U.S. National Top Ten US Halter Futurity and Canadian national Top Ten Futurity Halter win to her credit, as well as two Scottsdale TopTens, a Regional Championship, and 4 Regional Top Five halter wins. 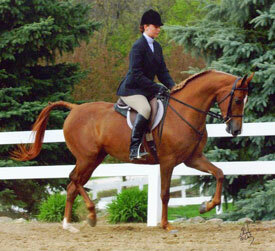 DR Aloven fame is the perfect amateur or youth horse. 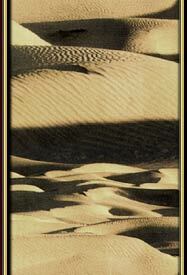 DVD and Video footage available. 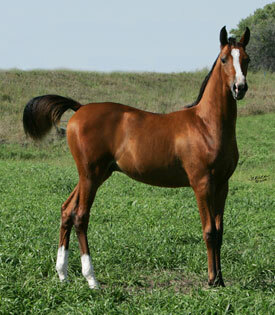 This 2004 filly is already a Regional Reserve Champion at halter as a yearling. She’s big, bay, and bold. 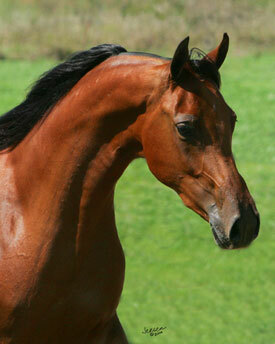 “Allie” will excel in the performance arena, either as a hunter or a big, beautiful bay western mare. Sweepstakes, National Futurities, and Iowa Gold Star nominated. DVD Available. 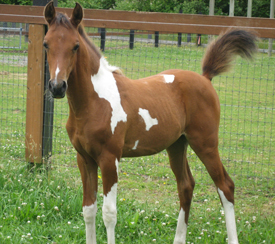 The Rock is Laquette’s first Color foal. 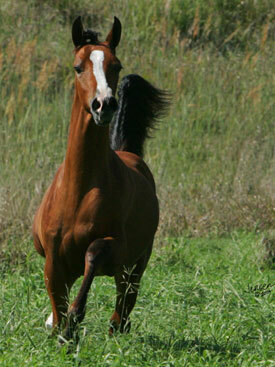 Needless to say the minute we saw him we decided to rebreed Brass back to Color again and she is in foal. His marking are great and he has a nice dish in the head. He is going to be a very good-sized horse in the 16+ range. 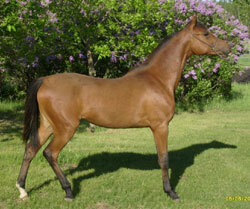 He has the potential to go national in halter and looks like a sure bet to be a great western Prospect. His temperament is low keyed and he is very sweet.